Mesentery anatomy, illustration. The mesentery is an organ in the abdomen that attaches the intestines to the posterior abdominal wall and forming the peritoneal folds. Its function is to store fat, as well as forming the intestinal supply of blood vessels, lymph vessels, and nerves. 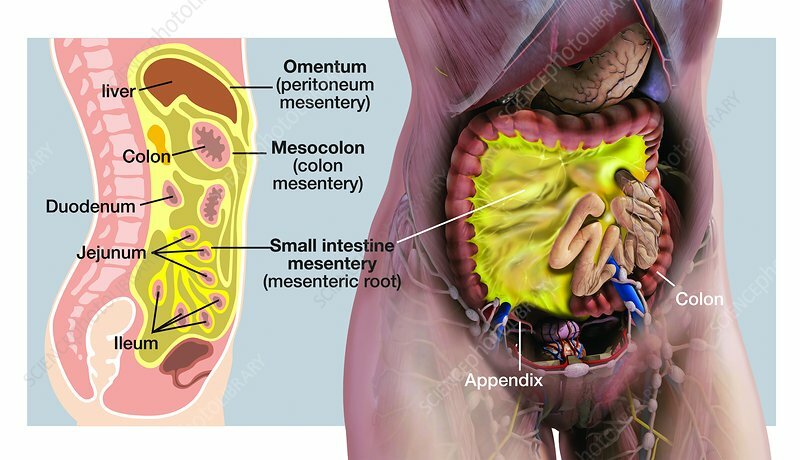 It arises from the mesenteric root in the small intestine, with the colon section of the mesentery known as the mesocolon. The upper portion (around the liver) is here labelled as the omentum or peritoneum mesentery. Knowledge of the anatomy of the mesentery is vital when carrying out intestinal surgery. For this illustration without labels, see image C042/4371.